Location: Pauanui Club Grounds, 31 Sheppard Avenue. 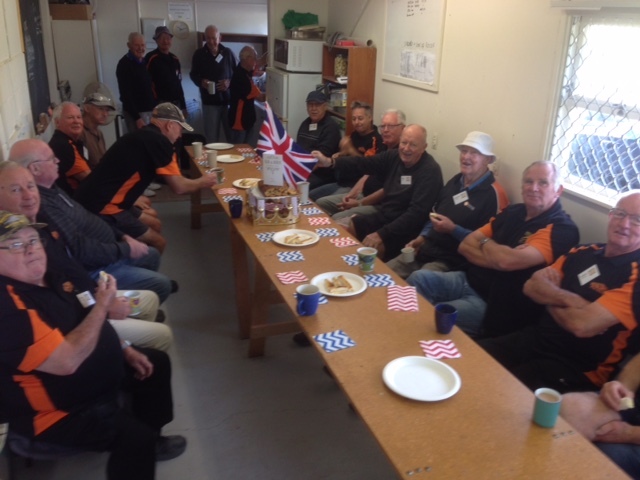 Our Menz Shed was established after an inaugural meeting of like minded men in December 2012. Incorporated in 2013 with a membership of 12 sheddies, we have grown in 5 years to over 45 at the last count. During that time sheddies have come from all walks of life and have helped us outgrow our original premises, tripping over each other and using machinery just doesn’t mix. Timber stored outside and gifts of equipment unusable due to lack of space. 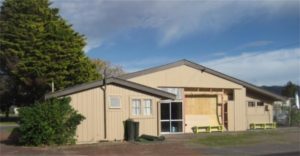 An opport unity to move to the Annexe of the Pauanui Sports & Recreation Club suited our Committee just fine. Although some jobs in the community are on hold until we sort our gear out, the move gives us a great workshop to develop over the next few years. Meantime a huge fundraising programme is well underway. 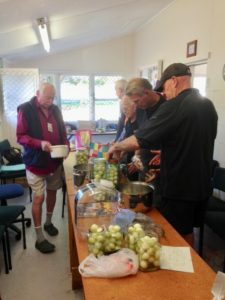 We are participating in a project involving the whole community, the RNZAF, all our sheddies and sponsors. The community goal is to sell 5,000 tickets @ $20 each of which $5 returns to the selling organisations – schools, sporting groups & the like. A parachutist will drop a dart on to our local airstrip, if the dart lands on your spot on the grid there’s a $50,000 prize. Many other prizes will be won on the day – a huge event with huge rewards. To date we have produced DOC style stoat traps to help rid pests in the surrounding bush reserves, built bench seats for the local walking/cycle trail, repaired small furniture and the like for elderly residents, erected directional signs for the Businessmen’s Association, repaired boardwalks and carried out other works in support of our community. Small items are produced from scrap materials and off cuts to help cover the costs of consumables. The sheddies have perfected sausage making in the past and have now tried their hands at pickled onions. Ever seen big men cry? We won’t know how successful it will be but from what they’ve achieved so far they’re sure to be pretty tasty. The recent Royal Wedding saw one of our Sheddies, Tony Watson, prepare a ‘salute’ to the happy couple. We downed tools, sang God Save The Queen in various tones, in and out of tune then demolished the beautiful Wedding Cake in quick time. This just goes to show we have respect for such occasions and are a pretty versatile lot. Weekly operations 9am – Midday, every Tuesday. Sheddies from throughout the movement are more than welcome to visit, morning tea is usually on at 10am, come, drop in, we’re a friendly lot.